Version 2 of Project 5 represents quite an overhaul. Cakewalk made some major announcements at the US Winter NAMM show. Cakewalk blew into the Winter NAMM 2005 show with a few surprises. First up is Project 5 v2, which is a significant upgrade. The program has been re-cast as a 'Performance Workstation', designed with fast composition in mind, but also as a studio and live performance tool. It now includes integrated multitrack audio — yes, you can record into it. But it also offers integrated per-track pattern triggering. (Translation: a somewhat Live-like vibe meets Akai MPC60 meets Sonar's Cyclone DXi.) Apparently, the new version has also borrowed a trick from Sonar's improved audio engine, as the company now claims P5 's engine can stand up to the rigours of live performance. They've also nicked Sonar 's loop editing, so it's possible to do per-slice control of pitch, pan and gain, as well as rearranging slices and exporting Acid-format loops. The per-track arpeggiator is pretty cool, as it can control automation parameters as well as notes. The PSYN soft synth has evolved into PSYN II, adding drive, modulation and delay effects. But the main soft-synth news, the inclusion of a multimode sampling synth, leads to more news: Cakewalk have acquired rgc:audio, of Triangle, Pentagon and z3ta+ soft-synth fame. The new synth offers the ability to mix and layer up to four voices drawn from samples, waveguide synthesis and analogue-style synthesis. Other P5 features include freeze, tap tempo, a track inspector and in-track automation. So is this starting to sound like Sonar? 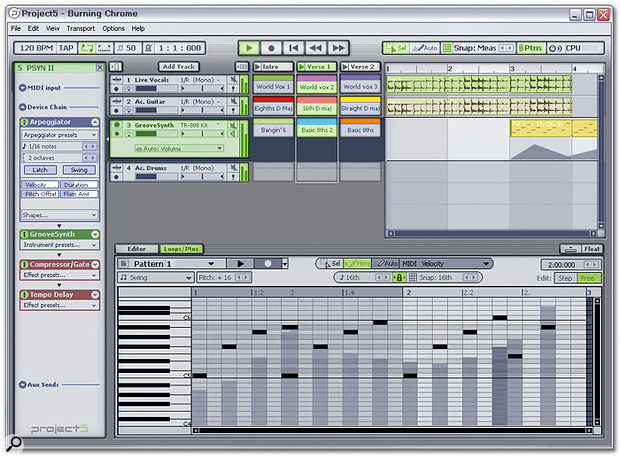 Well, although Sonar offers tools to help you compose, its roots are in recording, processing and mixing. Project 5 is a composition machine with a side order of recording and mixing. P5 also remains pattern/MIDI-based, while Sonar continues to emphasise linear tracks, HD recording and video integration. I don't have a 64-bit processor, and it's likely you don't either. So I might be forgiven for yawning a bit at this announcement... that is, I yawned until I talked to Ron Kuper, Cakewalk's VP of Engineering. As Ron explains it, Sonar going 64-bit is the key to a faster, more efficient recording experience. First, 64-bit allows a terabyte (1024GB) of RAM to be accessed. But before you roll your eyes, remember it's not long since the idea of having a gigabyte of RAM in your computer was preposterous — and now we have USB sticks with a GB of RAM for around £80. But why would you want that much RAM? Because loading loops, samples, and audio tracks into RAM means that the latency associated with disk streaming is gone — as is the issue of how many tracks you can pull from a drive before it begs for mercy. Second, 64-bit registers mean improved performance. In Cakewalk's testing of the 64-bit version of Sonar compared with the 32-bit version, performance increases averaged around 20-30 percent. As a bonus, 64-bit computations should end that 'digital mix busses don't sound as good as analogue' argument. There's no doubt that 64-bit computing is the wave of the future. Cakewalk seem to be catching that wave early, but that's fine with me. When 64-bit computing hits the masses, Sonar will already have worked out the bugs and be ready to go. You do need a complete 64-bit environment — drivers, OS and software — but Edirol, Creative and M-Audio already have 64-bit drivers for their interfaces. You can download the Sonar x64 Technology Preview for free from www.cakewalk.com/x64. Finally, a free pre-release beta version of Microsoft Windows XP Professional x64 Edition is available at www.microsoft.com/windowsxp/64bit. For more info on 64-bit computing, check out www.cakewalk.com/x64/FAQ. Cakewalk have decided to change their update schedule: rather than collecting multiple changes and putting together a major update, they now plan to introduce smaller changes more frequently. The latest free update improves the control surface interface. Control surface plug-in updates are included for the ADStech Red Rover, CM Labs Motormix, Mackie Universal Control and Mackie C4. OMF (Open Media Framework) import has been polished up as well, with user-selectable sample rate and bit depth, as well as the ability to read Avid/Pro Tools authored OMF files that contain Nest and Transition constructs. The VST Adapter now reduces plug-in load times and, perhaps more importantly, sends NRPN events directly to VSTi synths, while Quicktime export uses a faster, 'one-pass' process. And (a small but important enhancement) you can specify whether track/buss mute and solo should affect pre-fader sends. Finally, it's possible to export multi-channel audio to external command-line encoders... which I'm sure will be well-received by those using surround. You are out there, right? Hello? In any event, 4.0.2 is a free download from www.cakewalk.com.